This is an underwater walking journey through Miami Seaquarium's 300,000-gallon tropical reef. While wearing state-of-the-art dive helmets that allow them to breathe freely, guests will feel right at home under the sea. As they explore the reef they'll discover unique experiences around every corner. 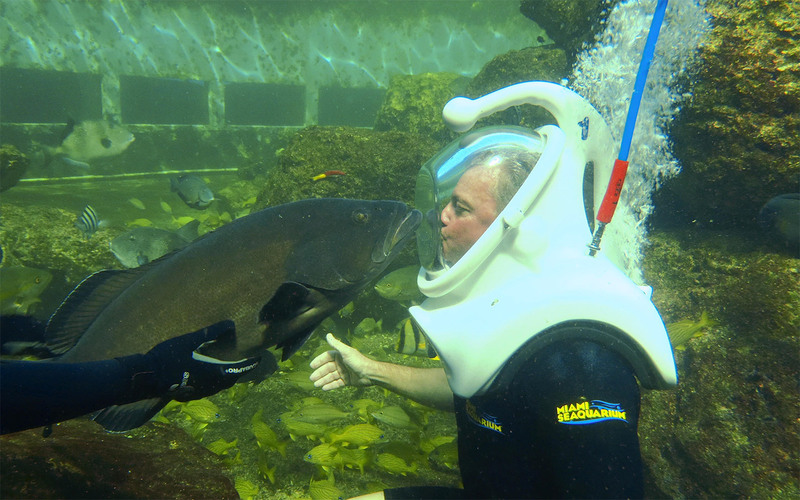 MIAMI TEMPTATIONS OFFER: During Miami Attraction & Museum Months this April and May, buy one, get one free Sea Trek Reef Encounter at Miami Seaquarium. Program restrictions apply. Available Wednesdays through Sundays. Advance Reservations required by calling 305/365-2501. Blackout dates: April 19-21, 2019. Must use this coupon between April 1 and May 31, 2019 to enjoy this offer. This coupon cannot be combined with other offers. Additional blackout dates and exclusions may apply.